The Content Module part of the Live Site appears in the center column(s) of your site. Delivered and Custom Content Modules allow you to display content your users need to see. You may also create Custom Modules to accomplish a variety of things on your Internal /or External KB page. There is no limit to the number of Custom Modules you can create. This document will show you how to modify delivered Content Modules and show you the basics of how to create a Custom Module. We will also refer to different kinds of Custom Content Modules. News and Announcements - Displays news content. Top Documents of the Week - Displays documents most recently viewed. Most Recently Updated Docs - Displays documents most recently edited and set to the status of Active. You may update the name of a delivered Content Module by navigating to the SitePref > Content Modules link > Content Modules screen. Put your cursor in the Module name field and update to something more relevant to your users. In the image below, a red arrow is pointing to and editable field. You may enter text that is more user specific, for example: "Atmospheric and Oceanic Sciences News". Be sure to click on the Update button on the bottom of the screen to save your work. To create a Custom Content Module, go to the SitePref > Content Modules link on the left navigation bar. This will lead you to the Content Modules screen. Module name - You may give a name to a delivered field. Example, for the delivered News Content Module in the image above, the module may be named "News This Week in the Department of Classics". This field is required. Internal - Check this box if you want the Content Module available on the Internal Live site. External - Check this box if you want the Content Module available on the External Live site. FullView - Check this box if you would like your Content Module to appear when viewing on a full desktop/ laptop screen view. MobileView - Check this box if you would like your Content Module to appear when viewing on mobile devices. Order - Select what order the Content Modules will appear on your site. Please remember we start with 0, 1, 2. Limit of number of items to display - The dropdown list appears in the delivered Content Modules only and defaults to 20 items. DocID(s) /URL - this field appears when creating a Custom Content Module. Enter one or a comma delimited string of document IDs. You may also enter a URL here. Add button - Please be sure to click this button to Add the your Custom Content Module. If you only click on the Update button on the bottom of the screen, your new Content Module will not be added. 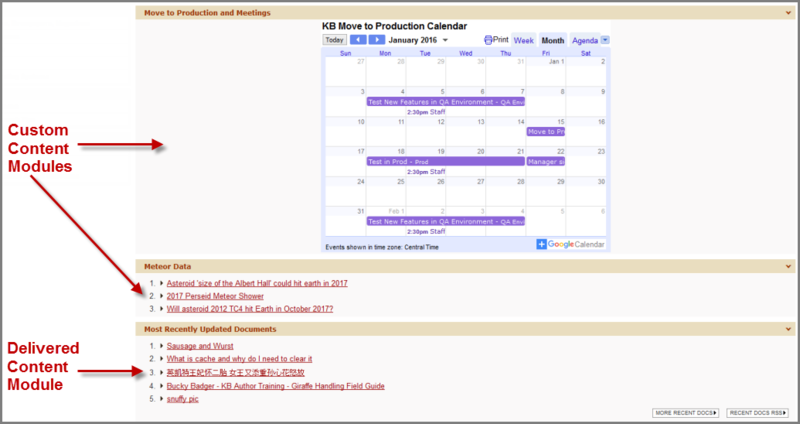 Display the Content of a single KB document - "Move to Production and Meetings" shows an embedded Google Calendar whose code/content resides on a single KB document. Display a custom list of docs in the sequence of your choosing - Meteor Data lists three specific documents selected by the Admin. Most Recently Updated Documents is a delivered Content Module. Create a KB document with the content (e.g. images, links, tables, Google Calendar Code) you want displayed in your Custom Content Module. Enter that single document ID number in the DocID(s)/URL field to display the body of that document. In the image below, the document ID 36843 is circled in red. The document must be in the Status of Active. The document SiteAccess must be set the appropriate KB Site. (In the example above, the "Calendar" should only be seen by Internal Staff and the Content Module will only appear on the Internal site. Therefore, the SiteAccess of your KB document should be set to Internal). We recommend you select the Search Priority of Exclude from search, especially if you think your users may be confused should they discover this content. Finally, click on the Update button at the bottom of the screen to save your changes. You may display a specific list of documents in the order of your choosing. In the Doc ID(s)/URL field, place a comma delimited list of the documents your would like displayed. In the image below, you will see three comma delimited document IDs for the Custom Module called, "Meteor Data". The documents listed must be in the Status of Active. The document Site Access of each document must be set the appropriate KB Site. (In the example above, the "Meteor Data" can be displayed internally, and externally. 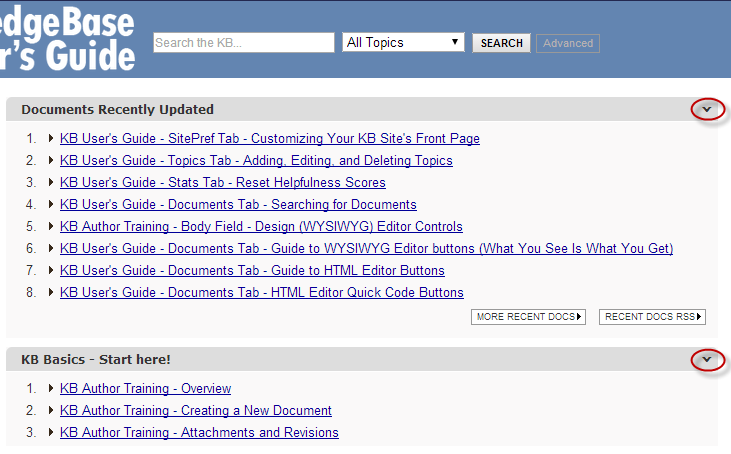 Therefore, the Site Access of these KB documents should be set to Internal and External). After creating Content Modules that best suit your KB site, you will see a downward pointing arrow/ chevron in the right corner. This arrow indicates that the Content Module is collapsible and then expandable. The KB will remember what you choose to collapse/expand and remember the next time you visit your Live site.